This basket of Easter eggs can’t wait until next year. Let’s keep the holiday going one more day to show off the bright lovelies from Greece’s Klio Tsaliki. 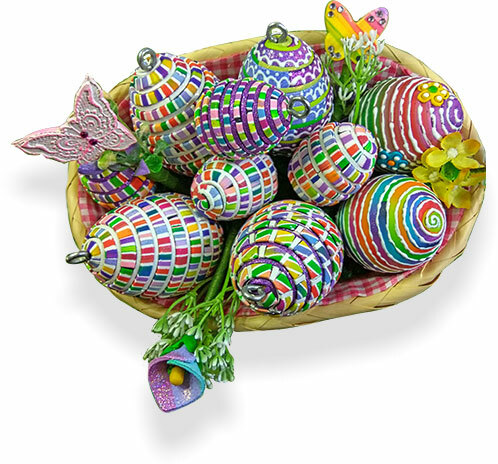 She’s wrapped the egg shapes in strips of clay covered with mosaic-like bits of sunny colors. File this idea away for next year’s decorations. Could this be the year that we actually get a polymer-covered egg made? No April-fooling! Germany’s Kerstin Rupprecht has already filled her basket. Take a look at them on Instagram. Last week Meg Newberg (PolymerClayWorkshop) showed us her fun repeating hearts made from a bullseye. With a few additions and sleight of hand, she makes that cane work from Valentines Day to Easter! If you look closely at the slices in the photo you’ll see hearts on the edges. 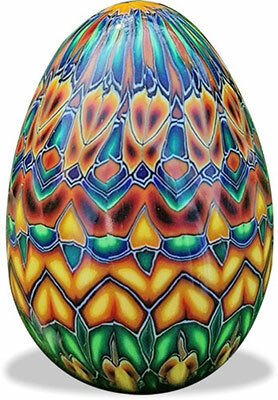 By cutting the original cane slightly differently and shaping it into triangles, then hexagons, she covers a hollow egg with slices. Don’t take my word for it, watch her give one of the quickest, cleverest classes ever. Her videos are on her Instagram. 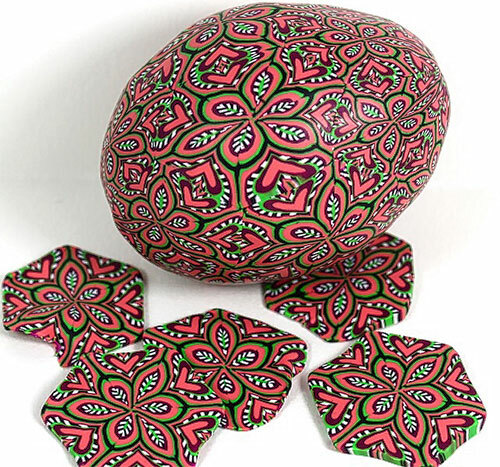 Egg-stremely difficult is how the UK’s Wentworth Puzzle catalog describes the wooden puzzle made from a photo of a grouping of polymer-covered eggs by Colorado’s Carol Simmons. All the puzzle pieces are the identical shape which elevates the level of difficulty. Using her rich and complex kaleidoscope patterns Carol is able to arrange a dizzying array of designs from the same cane. Read about Carol’s egg-sperience in arranging cane slices on eggshells in this post from the archives. Join us at StudioMojo on Saturday when we cover more polymer art, events, and ideas that you won’t want to miss out on. Sorry, no chocolate bunnies. 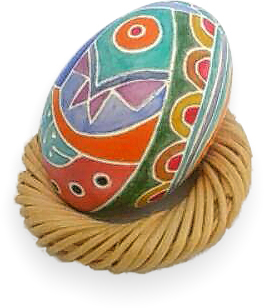 Serbia’s Nevenka Sabo covers this year’s eggs in polymer using a twist on her special Nambi technique. 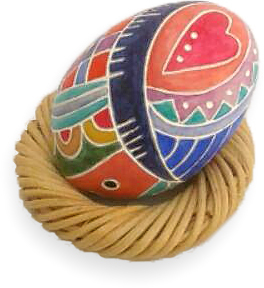 Think of it as African art meets Zentangles meets Ukranian pysanka eggs. 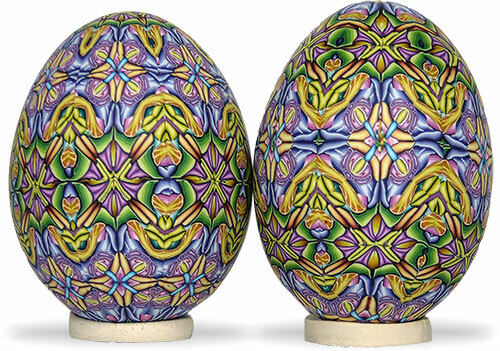 Instead of being covered with ethnic images, these updated eggs have a distinctly modern vibe rendered in punchy colors. Let’s hope your Easter basket is overflowing with trendy hippity hoppity goodies. If you’d like a more in-depth look at what’s happening in polymer art this spring, come join us for this week’s edition of StudioMojo. We’re coming right up on polymer-covered egg season and Illinois’ Jael Thorp is way ahead of the crowd. She winds strips of polymer pattern around hollow chicken shells. This time she resisted the urge to antique the patterns with a wash of darker color and let the vibrant colors speak for themselves. See more of Jael’s eggs on her Facebook, Flickr and blog pages. I’m taking a brief digital sabbatical and visiting family. I’ll be back with you mid-week.